We are a group of passionate people who love cars, and love helping people with their vehicle needs. Our mission is to have fun and create long lasting relationships with customers and employees, while getting people on the road, and keeping them on the road. During our long history of selling and servicing vehicles in southwestern Ontario, we have always looked to provide the absolute best customer service experience possible, and we have been recognized by manufacturers and customers with high scores and top grades in this area. We also have endeavored to make each of our Dealerships leaders in vehicle sales and market share no matter how small our home towns are. We’ve found out that people will drive a little bit further for a better deal, a better place to work, and a better service experience. The Lally Auto Group is a group of new and used car stores with multiple Ford, Kia, Mazda, Chrysler and Lincoln dealerships and a Used Vehicle Superstore. We are happy to serve the Tilbury, Leamington and Chatham regions, and are proud that we routinely serve people from across southwestern Ontario, and our neighbouring towns of Lakeshore, Dresden, Kingsville, Pain Court, and Windsor. Our dedicated sales staff and top-trained technicians are here to make your auto shopping experience fun and easy. 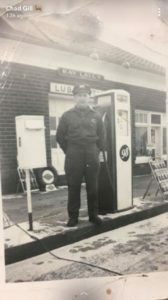 In 1946 Ray and Rita Lally opened a small service station in Comber, Ontario, and immediately set a high standard for how their customers would be rewarded for doing business with their family. Ray Lally believed in hard work and doing the right thing, whether that was washing your window and checking your oil when you stopped in for gas, or never saying no to a customer for a tow call on a late night. The gas station was always a family business, Rita kept things in line and all the kids (5 girls and 1 boy) pumped gas and cleaned up the shop. In 1951, the service station expanded to Lally Sales and Service. 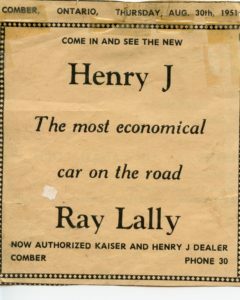 It was one of the first “Henry J” dealers in Canada. They always had a used car or two for sale before this, and this franchise gave them the opportunity to sell one of the best vehicles on the road at the time. Later, during the fuel crisis in the 1970’s Subaru was just coming into Canada and was looking for dealers. The Lally’s, now with their son Vince involved in the business, decided to become a Subaru dealer and were actually one of the first 3 Subaru dealers in Canada. At this time Vince was a jack of all trades; a certified mechanic who would wear his shirt and tie under his coveralls, so he could sell Subarus in between repair jobs. In the fall of 1982, the family brought their work ethic and customer-oriented manner of doing business under the Ford logo in Comber, and three years later Vince bought the dealership from his parents. By 1995, there was a need to expand and the dealership moved down the road to Tilbury and its current facility in what is now referred to as the Tilbury Auto Mall. From the beginning, Lally Ford earned awards from Ford Motor Company, including the prestigious Diamond Club Service Award and the President’s Award over 24 times. This tradition of customer satisfaction and the amazing team of employees at Lally Ford allowed for growth. 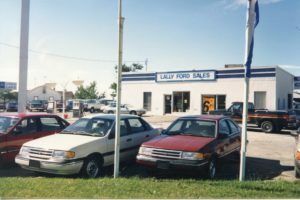 In the late 90s, Mill West Auto Sales was opened up the road in Tilbury, and later moved a little further up the road and became Lakeshore Auto. Selling high quality late model used vehicles that are reconditioned to the highest standards. In 2007, Lally Southpoint Ford opened in Leamington at it’s current beautiful home on Highway 3. It is the most “South” Ford dealership in Canada and is a short drive to “Point” Pelee Provincial Park. Later in 2010, Vince and family purchased Victory Ford Lincoln in neighbouring Chatham, Ontario, which brought a new market and the Lincoln luxury brand into the fold. Shortly after, Victory Ford Lincoln moved across the street to a brand new facility with a state of the art service operation and a large showroom. Then in 2012, going outside of the Ford umbrella, the Lally’s opened Lally Kia at the former John Gibbons Pontiac (then Kia) location just up the road on Richmond Street in Chatham. By this time Adam, Vince’s son, had joined the business and was passionate about the opportunities for growth in the local car market. Most recently in 2017, the Lally Auto Group expanded again with the acquisitions of Chatham Chrysler and Chatham Mazda. Chatham Mazda had a beautiful new home already. Chatham Chrysler immediately began showroom renovations that are now complete and allow the building to better represent the great cars, employees and customers inside. Throughout this growth, and at all locations, one thing remains constant; the people make the difference and relationships are important. We believe that the foundation of success and growth is and will always be customer satisfaction. The dedicated staff of the Lally Auto Group are friendly people who care about other people and their cars. Each dealership is independently managed and has a different personality just like the people inside, but the small town feel and smiles you’ll see are consistent across all stores and a cornerstone of our family business. purchase their new and used vehicles. receive the best service on their vehicles. purchase high quality auto parts. come to work in the car business. We invite you to contact us now and experience the Lally difference, or if you or someone you know is interested in working with us, see more here.